After years of misfire celebrity stunt-casting, irrelevant scenic “spectaculars,” and half-hearted updating gimmicks, would you understand me if I said how refreshing it is to see a Public Theatre Shakespeare in the Park production that actually felt like seeing a serious production of…Shakespeare? The (so far) much-maligned Hamlet currently at the Central Park Delacorte certainly has problems—but they are by and large the failings that curse most Hamlet productions: a weak Gertrude and Claudius, an interminable Act IV, a general petering out of everyone’s energy by the end. But these flaws, as I said, are common—in fact, so common I’m beginning to wonder if they’re built into the play itself. But if there’s one thing director Oskar Eustis got right, it’s the most important thing—he got the right Hamlet. Or at least the right Hamlet for this production. If Eustis’ staging and conceptualization of the play is less dynamic, less visually dazzling, and, yes, longer than others, these qualities suit the quiet, thoughtful sensibility of his star, Michael Stuhlbarg. I remember a directing mentor of mine once declaring, “You have to decide who is your Hamlet? Is he a warrior? A lover? 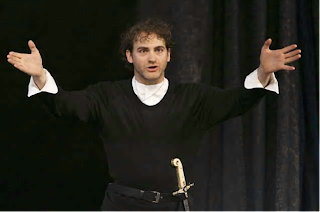 A manic depressive?” Well Eustis and Stuhlbarg remind us of one key identity of the characters’ that so often gets lost in legend: Hamlet the Scholar. Or, dare I say: the nerd? While the world of Elsinore does not crystallize as specifically as I would like, Eustis does flesh out—through wonderful performances—the Polonius family better than most productions I have seen. Sam Waterston’s well-meaning dotty dad seems to be the critics’ favorite. But it is as part of a family unit that I appreciate him, Lauren Ambrose’s Ophelia, and David Harbour’s Laertes most, more than as individuals. In a wonderful touch in the opening court scene, Habour plays Laertes against type from the beginning; rather than the bland, loyal son he seems an outright hedonist, drink in hand, begging Claudius to just let him go back to France for god’s sake! The payoff for this, at first, comical choice, is the stark contrast to Laertes’ later “maturation,” if you want to call it that, from careless boy to single-minded avenger. But rather than being merely Hamlet’s mirror, Eustis and Harbour (a big man whose physical contrast to Stuhlbarg is striking) mark him as in every way more conventional than the prince—fratboy on one end, violent aggressor on the other. When Stuhlbarg dances with glee at his few “palpable hits” in the climactic swordplay with Laertes, the cheer of the underdog is delightful. And doubly tragic given our foreknowledge of how short-lived it is to be. Ambrose—whose much-praised Juliet last year in the park I missed, but can now believe—achieves that rare balance for a modern Ophelia: to convey innocence without weakness. Far too many readings of late have tried to insist on Polonius’ puppet daughter as a worldly independent agent from Act I, but this robs her story of all its tragic arc in this man’s world of a play. Plus, only the spirit of innocent can convincingly sell the crestfallen moment of her rejection by Hamlet—the onset of the disillusionment that will lead to her death. Both Ambrose and Stuhlbarg manage to bring a purity and freshness to these overly familiar roles. In her mad scene (part of that always interminable Hamlet-less Act IV) I’m afraid she still falls into the rambling obscurity and overly-obvious sexuality that actors and directors seem to inevitably resort to in this scene. (Does no one take seriously the line “incapable of her own distress”?) But her “punk” look was kind of original and Ambrose never veers into falseness. Who knew one of our finest classical actresses needed “Six Feet Under” to get noticed? As for the Gertrude and Claudius problem, Margaret Colin and Andre Braugher seem to be playing it awfully safe. Braugher is a stage actor capable of real power. But perhaps he and Eustis are so afraid of unleashing the character’s clear menace, that they “nice” him out of the conflict altogether. With such an unthreatening Claudius, we again have to wonder: “what’s the problem Hamlet? Take him!” (Even Stuhlbarg could, I felt!) Other avenues to make the royal couple interesting—like hedonistic decadence or crippling paranoia—sadly go unexplored. Amidst such challenges, the pressure on Hamlet himself to deliver is pretty high. But again, Stuhlbarg does. Through nothing other than ceaseless intelligence, persistent calm and focus, and an ingratiating relationship with the audience. Some critics have called him cerebral or unaffecting. But I—albeit already a Stuhlbarg fan—was deeply moved. (When was the last time you were actually sorry to see Hamlet die?) So reactions to him on a personal/empathic level seem pretty subjective, to say the least. By taking his cue from the spirit and energy of his lead actor, then, Eustis provides a production that is similarly leisurely, thoughtful, and thorough. I have never, never felt before in the Delacorte Theater the luxury of sitting there on a midsummer’s night and simply listening to and experiencing THE PLAY. Normally in Hamlet I start checking my watch during The Mousetrap. (Which is here, by the way, rendered vibrantly by some Basil Twist uber-marionettes, a terrific choice.) But this time I could finally appreciate the luxury of—and it truly is a luxury in today’s world—of setting aside time to encounter such a text in performance. That it takes more than three hours in this case…all the more of a treat, surprisingly. Provided the weather agrees. Whatever one thinks of Michael Stuhlbarg’s performance here, ponder this: here’s an actor who typifies the hard-working stage artist of his generation. Years devoted to training, to gigs far and wide in regional theatre. Occasional triumphs in great roles that no one sees. Only a handful of Broadway credits (with only Pillowman getting him notice) and even fewer bona fide movies (on IMDB at least). This is not the name you headline your Hamlet with in the commercialized theatre of the day. In doing so, Eusitis has honored not only a fine actor, but by extension, the American stage acting profession. Don't be lonely, Paul. We're all pulling for you! Ok, to get Julian's joke above, you would have to follow "Lonely Paul's" link. But to save you the trouble...guy needs to get married and/or laid. Let's stay on topic Mr Paul!!! This is Hamlet, after all. Beauatiful Reveiw. I wss't there but felt I saw it, at least through a crack, and felt the angst of a wronged son. Great articulation of the long held-out accolades for American actors. Glad you mentioned being 'Moved" as an important criteria for a produciton. thanks for this. I saw Hamlet last night and would say your review is right on. But why no mention of the killing of Horatio? what do you make of it? Excellent question, Milo. I just ran out of gas writing that, so glad to have the opportunity to expand. Well first of all, I saw it as a blatant homage to (if not steal from) Ingmar Bergman's famous production in the 80s, when Fortinbras and his punk-army stormed the stage, summarily executing Horatio and everyone else. Bergman's ending was daring and out-there, but it worked because he had a much more freewheeling, expressive production all along--and he prepped you for that ending with an amazing Act IV scene with Fortinbras' army, where you saw all his soldiers. I will say though that (and here I doth SPOIL so be thou ALERT) the blood-spatter off Horatio's head was the best I've seen onstage. Well, since Lieutennant of Innishmore, at least. In fact, I have a new theory/reading of the politics of the play. I now imagine Claudius and some co-conspirators as a bunch of Jacobean neocons, hell bent on destroying Norway (Denmark's ancient enemy.) Claudius thus kills his brother the king, for political reasons, being too dovish toward the former foe. After old Hamlet slew old Norway thirty years ago (the day young Hamlet was born we are told) maybe the old warrior went all detente and ended the two nations' "cold war." You can read a hint of this into the fact that Norway is Claudius' first order of business in his opening scene at court. We learn from the ambassadors that young Fortinbras is out to avenge his father's death (and by implication his kingdom's shame). What if Claudius & co. (in which we might as well include Polonius, if not Gertrude herself) see Fortinbras as their Sadaam Hussein? Sure he sends the ambassador off to make peace. But maybe only to stall him. Anyway, I don't expect all this could ever be communicated in performance (at least with the given text) but I find it fun. Branagh's film at least tried to capture some sense of these politics in his "flashbacks." there was no ghost. it was an actor dressed to look like prince hamlets father. the reason I still remember this production not just for Stulbargs' brilliant performance but for Eustis having the courage to suggest this in the assasination scene at the end. Where was Horatio while the coup was taking place? Why is he and the guards and Hamlet the only ones who can see the ghost? Cause they had to try it out on the guards first. If they fool the guards into believing they saw a real ghost then certainly they could fool an unsteady now traumatized mind full of greif and understandably paranoid into believing that the actor dressed up to be the father was a ghost. They had to get rid of Horatio at the end cause he was the only survivor who knew of the plan to betray his friend. When Hamlet sees the ghost while fighting with his mother he is all ready in such a state of madness that in his paranoia he thinks polonius is cladius but by now his mind is quite disturbed as we the audience are too by his actions. and we believe he is mad but do we believe there was a ghost?